The first where the 470, Finn, Laser and Radial classes will sail their final races to decide the medal race configuration for Sunday, while later the 49er, 49erFX, Nacra 17 and RS:X classes will hold their medal races. British Sailing Team members have made it into four of the five medal races, with realistic chances of podium places in two, the 49er and 49erFX, and a possible medal in the Nacra17. Emma Wilson and Bryony Shaw also start in the women’s RS:X, but back in ninth and tenth places. In the 49er event Erik Heil and Thomas Ploessel of Germany have a 12 point advantage over Dylan Fletcher and Stuart Bithell, with James Peters and Fynn Sterritt two points back in third. The fourth placed pair Sime and Mihovil Fantela could be a danger for Peters and Sterritt, if they can get away. In the women’s 49erFX medal race, New Zealand’s Alexandra Maloney and Molly Meech should have the gold covered, while Charlotte Dobson and Saskia Tidey will challenge the Brazilian pair, Martine Grael and Kahena Kunze for the silver. The Nacra17 gold looks to be between the Aussie pair, Jason Waterhouse and Lisa Darmanin, and Samuel Albrecht and Gabriela Nicolino de Sá of Brazil. There is then a 12 point gap to the next three, who are very tight, and Britain’s John Gimson and Anna Burnet have a good chance to grab the bronze in a general shoot-out finish. The two RS:X races do not have any British podium contenders, but Emma Wilson and Bryony Shaw beat the cut, so have a chance of medal race win glory. The podium looks a three-way battle for the medals, just two points covering the leaders; Yunxiu Lu, Charline Picon and Katy Spychakov. The men’s RS:X is very open with Poland’s Pawel Tarnowski having a five point lead on Pierre Le Coq of France, but after that any of the top seven could garb a podium place. 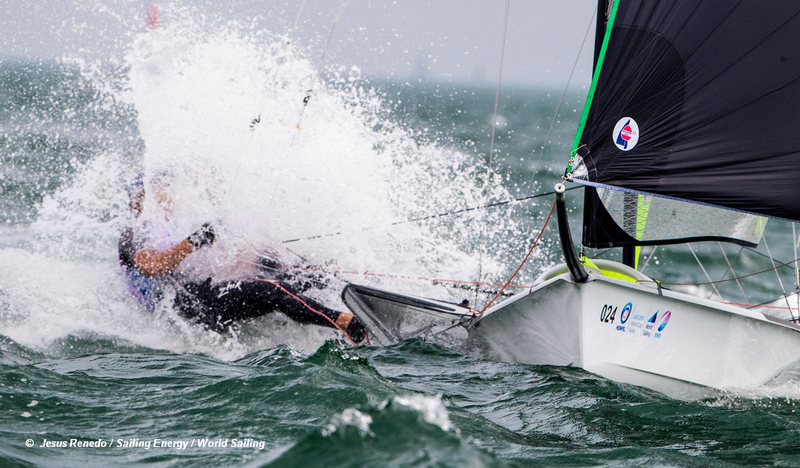 Medal racing will be broadcast live, here on Sailweb from 17:00 hrs.